1 avocado, halved, peeled, thinly sliced, sprinkled with lemon juice to keep it from turning brown. Combine pork, stock, half of the onions, jalapeno, cilantro, cumin, bay leaf and 1/2 teaspoon of the salt in medium saucepan. Cover, reduce to a simmer. Cook until pork registers 140° on an instant read thermometer. (Approximately 10-15 minutes). The meat will be slightly pink in the middle but very tender. Shred the meat into 2 inch peices with two forks. (Discard water from saucepan). Put meat on a baking sheet, add the rest of the chopped onions. Melt the butter, mix the butter with olive oil and pour over the meat and onions. Broil until golden brown (7-10 minutes). Whisk together masa harina, flour, baking powder and salt in a large bowl. Stir in corn and cheese. Heat 1/4 c oil in fry pan or cast iron skillet over medium heat until hot but not smoking. Meanwhile, shape 1/3 cup of mixture with your hands to form a patty that is approximately 1/3 inch think. Repeat with remaining mixture, making 8 patties. Working in batches of 4, fry patties, turning once, until golden brown. This takes approximately 2-4 minutes per side. Using a slotted spoon, transfer to a paper towel to drain. If pan becomes dry, add more oil as you go. Cover patties with foil to keep them warm until ready to serve. 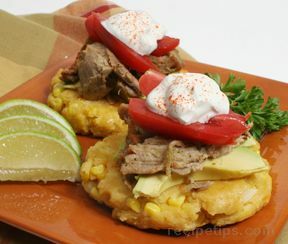 Top each corn cake with 3 avocado slices, a heaping 1/3 cup pork, 2 tomato wedges and 1 tablespoon sour cream. 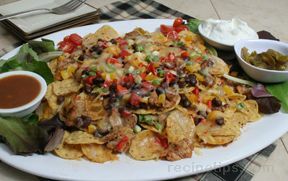 "This is an amazing recipe; the flavours are unique and delicious and it's so easy to make! 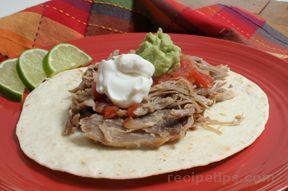 I cooked the pork in a crock pot and it's delicious. I'm using the left over liquid for soup stock."